The late 1980s and early 1990s saw a raft of out-of-town shopping centres open their doors for the first time. Essex, a county with a reputation for flashing the cash, became home to Lakeside exactly a quarter of a century ago. Once scoffed at for its "white stiletto" stereotype, Lakeside went on to star in a hit TV docusoap and now boasts a burgeoning collection of high-end retailers. With two million square feet of weather-proof shop floor, Lakeside represented a "pioneering" new style of shopping for millions of people in south-east England. Richard Belt was the centre's general manager from 1993 to 2000, and remembers the thrill of the first few years. "There was a huge amount of excitement about changing the game of shopping in the UK. From customers, whilst there was curiosity, there was also huge interest," he said. But introducing shoppers and retailers to the idea of a landmark shopping centre in Essex was not all plain sailing. Image caption Richard Belt was Lakeside's general manager for seven years and appeared in the docusoap "Lakesiders"
Mr Belt recalls how it was "initially a challenge for the upmarket brands to see Lakeside as their sort of environment". "You've got The Only Way Is Essex now, but in a way Lakeside had the 'white stiletto' view about it then. That's what everyone thought about Essex girls," he said. "Part of the challenge we had from a retailer perspective is that people were coming from all over the place, not just Essex. "There was a lack of knowledge about how regional centres worked in terms of where people were coming from. "We had to get the message across about the '90-minute drive-time' shoppers, not just the white stilettos." In 1998, the shopping centre took centre stage on the nation's TV screens when the BBC made a docusoap entitled "Lakesiders". Eight episodes followed the fortunes of shop staff, the centre manager and event organisers, watched by about nine million people each week. "It was a very interesting experience to go through at the time. There's no doubt it helped us," Mr Belt said. "It was the first time people had been aware that we had control rooms, security guards monitoring what was happening. "The year after broadcast, shoplifting and crime plummeted because people had seen how we controlled things." Image caption Some of those who starred in the 1998 BBC docusoap "Lakesiders"
Fast-forward to 2015, and upmarket brands like Kurt Geiger, Tag Heuer and Mac have opened branches in the centre, which is now called intu Lakeside. Marc Myers, who took up the post of general manager nine months ago, said he was "delighted with the mix of shops we've got". "There are some retailers who talk about things that I think are very much in the past about Essex and Lakeside," he said. "When people do venture out and come here and see the retail line-up - our raison d'être is about a decent retail offering - their perceptions are very quickly changed. "Those sort of aspirational brands for customers only come to a destination if it's right for them, and they wouldn't take the risk of coming here if they didn't believe we had the right demographic in this shopping centre and the area to meet their expectations." Writer and journalist Pete May, author of The Joy of Essex, said Lakeside's location may have initially put retailers off. "I think maybe part of the problem is that it feels very 'Essex' - it's right next to the A13 - and that part of estuary Essex has always been seen as a bit downmarket," he said. "Maybe the post-industrial site was putting people off at first, but I think Lakeside has played a part in making people see it as a bit more upmarket. "One thing about Essex people is they're upwardly mobile and aspirational, so they might like more designer brands being introduced." The site, which now comprises 1.4 million square feet, 249 retail units, numerous restaurants and a cinema, was built inside a former chalk quarry in West Thurrock. Pictures from the early 90s show plants adorning most of the public areas, and fashionable fountains dotted around. 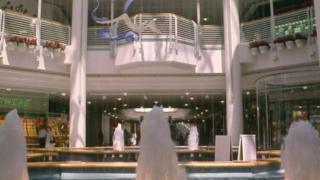 "When the centre opened, there were fountains down both ends and in the central atrium," Mr Myers said. "They were removed when we had a refurbishment in the mid-2000s, because they were no longer seen to be the vogue." When Lakeside opened, its first manager Brian Lucas told The Independent he thought there should be a limit on the number of out-of-town shopping centres in Britain, as he had visited the US where he had seen city centres reduced to "depopulated ghettos". Mr Belt had a similar memory: "There was a lot of concern locally about the impact on neighbouring towns and cities, because they were an unknown quantity." Chris Weeks, manager of nearby Grays shopping centre, said although he was not manager at the time, he understood Lakeside initially had "a massive impact" on the town centre. In a retail study published in 2012, Thurrock Council said Grays' role as the "dominant retail centre in the area" had been "superseded" by Lakeside, and the town now had "limited attractors". The study says Grays should "distinguish its retail offer" and improve consumer choice in order to maintain its viability. Mr Weeks said his own shopping centre "worked alongside Lakeside rather than against them". And just as Lakeside presents town centres with competition, the massive growth in internet shopping amounts to a similar challenge for Lakeside itself. What does the future hold? Plans are being laid out for a £100m development of new cafes, restaurants and fitness facilities centred around a public square. "Leisure and events are ever more important," claims Mr Myers. "The whole retail horizon has changed. The way people make purchases has changed - they can sit at home on their iPad or their iPhone and they don't need to come into a shopping centre or a high street. "It's ever more important that those kinds of activities can draw people in here and increase how long they stay." Linda Moulder, 69, from Rainham, east London, said her grandchildren love Lakeside "because of the shoe shops". "Most of the general retailers are here. John Lewis isn't - that would be nice. But there's not the big brands, you'd have to go to Westfield for that." Nineteen-year-old Emily Moss and James McCormick, 27, travelled from Chelmsford for their second visit to Lakeside. "It's better than shopping in Chelmsford. Instead of running round through the rain, we can just come here. And there's a Disney store," Miss Moss said. Mr McCormick said Lakeside had a "slightly cheaper feeling than Bluewater". "It's good in a way, because you know you'll get more for your money. They cater for two different groups of people," he said. Celebrations for intu Lakeside's birthday include a performance by pop band B*Witched and "the ultimate game of musical chairs" among other things. Mr Myers said he was confident about the future of Lakeside, once the only out-of-town shopping centre in the area but now facing competition from nearby Bluewater and Westfield Stratford. "We've welcomed probably 650 million customers through our doors since we opened, and I think the next 25 years will see that more than double as we develop." And although he is aware of the threat posed to places like Lakeside by the meteoric rise of online shopping, Mr Myers thinks "physical shopping" has one distinct advantage. "They'll never be able to feed people over the internet or online. Whilst we continue to have decent restaurants, that will draw people in time and time again to Lakeside."